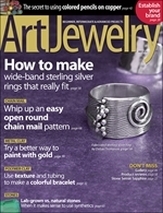 In the Art Jewelry magazine project, “Expand Your Polymer Skills with a Savvy Stretch Bracelet” [July 2010], the instructions call for SoftGlass tubing with a 1.5mm Inside Diameter (ID). Just as the magazine was going to print, I learned that the manufacturer of SoftGlass updated their product; the tube opening is now smaller, making stringing the elastic impossible given the original instructions. 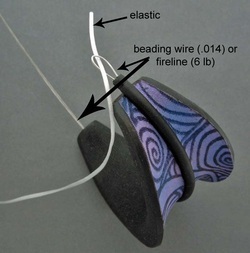 Cut a piece of thin beading wire (.014, .015) or fireline (6 lb) over double the length of your leaf length. Put both ends into the softglass opening and string them through the softglass so they are extending through the opposite leaf end of the softglass, leaving a small loop as shown. Put a small tail of elastic through the loop. Pull the extended wire ends. 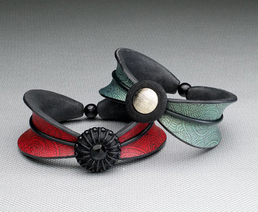 The loop will tighten around the elastic and pull it through the tube. I would like thank Dawn Dutrizac-Larose, one of my Vancouver workshop attendees, for this simple and foolproof solution.